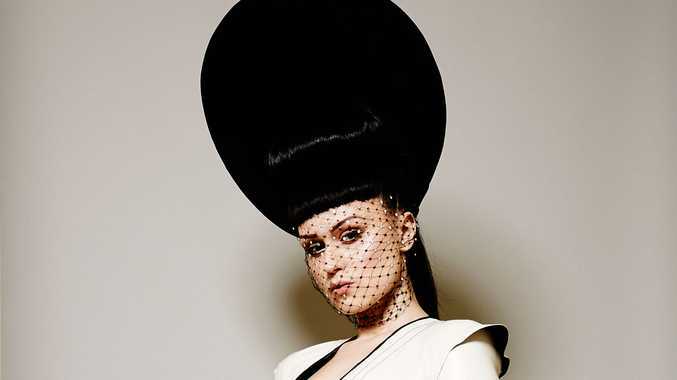 At the age of 20 Viktoria Modesta asked doctors to remove her lower left leg. The Latvian singer had undergone 15 surgeries to improve its growth, but she refused to allow a health issue stall her ambitions. Six years on and she's just released the video to track "Prototype", in which she challenges preconceptions of disability and sexuality. "Forget what you knew about disability", reads a message before the start of the electro-pop song and you'd be hard pushed to otherwise. Modestra dances like any other contemporary pop star, lithely and provocatively moving with her light-up prosthetic limb. Confident, uninhibited and strong, she could well be, as her lyrics suggest, "the model of the future". "The first record I bought was Prodigy and 2Pac, when I came to London I went through a lot of musical scenes - Garage, Trance, Metal, Swing and Electro. I'd say my music palette is very broad, I can appreciate almost any kind of music but when I'm in the studio it usually ends up Bass Pop with some epic synths or strings." "…Which damaged my leg and stalled its growth, which led to 15 operations between ages of 6 and 12. My attitude towards myself is as an equal individual to any other human, no matter how superior they might like to portray themselves and this has been the key focus in my life, the feeling of equality and freedom. It's just a kind attitude to have towards others, and it is also a liberating element of self-discovery. Since the voluntary amputation of my damaged leg I have been able to lead a fully functioning life not just creatively but also physically." "I prefer seeing it as a health problem. The word disabled lost its meaning for me a long time ago and I find it too broad in scope and inaccurate. We are no longer living in the forests and jungles where a person with a physical body issue cannot reach their highest potential as a human being through other achievements, and physical ability or strength have nothing to do with that in my opinion. If we talk about intelligence ̶ which is something that's leading the modern world ̶ then the term disability and who it may apply to is very much turned on its head. I believe if anyone is going to label people disabled, then their overall capabilities should be considered." "The sad truth of being a kid or a teenager is you will get picked on about everything. For having the wrong name, weight, skin, your financial status…I mean the list goes on and on and in my case I had all the bully attractions going for me. I was foreign, I had different style, I was a bad girl and I happened to have a limp. Not at any point did I feel like I was treated differently only because I had a problem with my leg but from an early age I was the definition of a rebel and free spirit so that in itself was enough to create the focus for the large amount of negative treatment throughout my teenage years." "At that point I felt totally trapped. I started socialising at an early age with much older groups of people which didn't engage in making fun out of someone that came across as different so it was a vast contrast coming to school and being called names when I was finding a place for myself amongst the fashion and club scene in London where I was being treated with respect based of my personality. "For me personally leaving school was the best thing I've done other than my operation. I still think there should be more options for kids who suffer from bullying ̶ more nurture and options to develop into young adults without being terrorised." "I was forming into a very creative young dreamer, I loved music, fashion ad clubs. 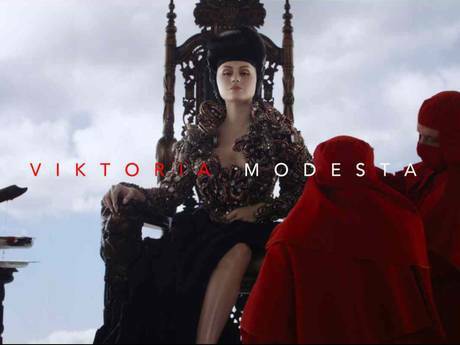 I was very inspired by Aimee Mullins in the Creamaster film by Mathew Barney where she wore all kind of amazing conceptual prosthetics and walked at the Alexander McQueen fashion show. Seeing that made me totally hypnotised by how much freedom and choice there is out there - if only was proactive about it. It took five years to get the doctors to agree the operation but it was absolutely worth the wait." "I felt instantly rejuvenated like a new person. Within a month I was out walking on my first limb with a diamond cane for support. The journey of the different prosthetics I've been able to work with and express myself with has been truly inspiring. I live my life in a conceptual way. I get to express my identity to its fullest eccentric limit with no compromise, I chose to merge my music and fashion with my psychical identity and I feel very comfortable about that. I believe a lot of people are afraid to follow their aspirations the society around us aims all of us to be normal so we go on feeling and questioning if are we normal and do we fit in but I think the focus should be on being an individual and enjoying our differences." "I believe sexuality is a basic human right. No one should have that taken away from them. I am not intending to fight a global battle on disability and sexuality however I hope that through my personal journey I can get people to ask themselves - where do their views come from on these subjects, are they their own, or have they been simply influenced by the uneducated folk tales." "It's the centuries of superstition. Just like people with mental disorders used to be considered possessed, the physical differences install fear into people that it could affect them. It's almost as though they need to be told they will be ok ̶ not that you are ok. The question of physical activities is much easier to swallow somehow. It's basic ̶ it's straight forward. I think that people who have to overcome struggle in their life become very resilient and determined people they also learn to overcompensate for their shortcomings and therefore could be considered more unpredictable. "I don't know how the public feel about having leader and icons that pave the way culturally and politically that only 50 years ago used to be considered second class citizens or in more crude words cripples. How do you feel about that? The time for genuine equality is now. The issues of race and gender are getting somewhere it's time to understand that physicality is often external and doesn't make you any less of a human who is considered able bodied." "It's been very exciting to join Channel 4 in this magical journey. They pioneered the coverage of Paralympics and the Superhuman series and so working together was the most natural decision. They haven't found anyone that took the fusion of bionic body, music and fashion to a higher level and were keen to create a platform for me. It was of dual benefit, it took over a year to execute this project with every step staying authentic and passionate. I am very pleased with the results so far. I didn't have any specific hopes for it other than the chance to present my truth and the fact that the world reacted and is taking the time to examine and interpret it is wonderful." "Forget what anyone said you can't do. Only you know what you are capable of and only you know who you truly are. Stay honest and look for things and people that make you happy."